Must be one of the best online purchasing experiences that I have had. 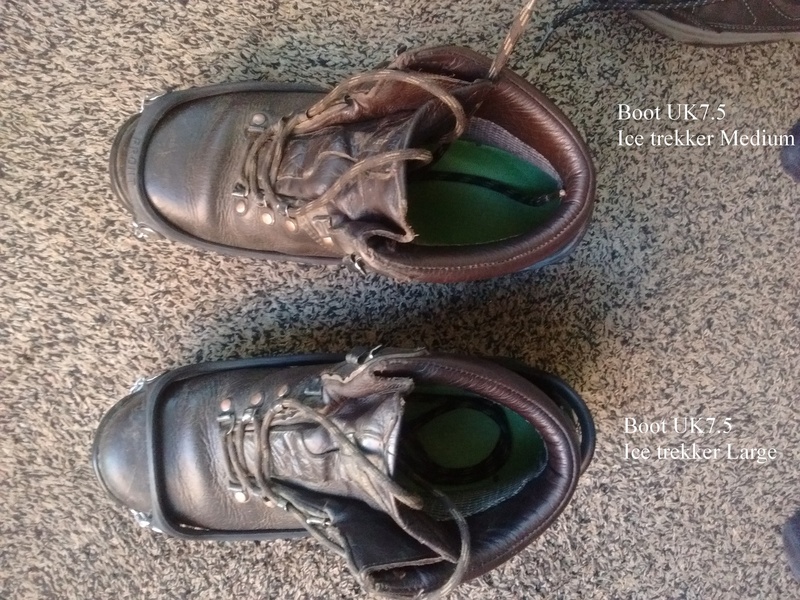 I was interested in Ice trekkers diamond grips but my boots were close to the change from medium to large. I phoned to discuss this (fairly unusual these day to be able to talk to a human!) and received sound advice. May be I should go for the large but if they were unsuitable they would be changed. Opted for the medium as I hoped to use them on both boots and robust shoes. When I received them they seemed pretty small and not being used to such devices they seemed very difficult to fit. So a quick phone call and a pair of large were shipped out so I could compare the sizes. These turned out to be far too large. My boots are 7.5UK. So I practiced putting on the mediums and found they weren't too bad after all. Posted the unwanted pair back to Ice Grippers and will be keeping these grippers in my rucksack during the winter months. Can't comment on the effectiveness on ice from personal experience yet, but I know someone who has got through two pairs and swears by them. Great. Ordered from the Netherlands and received the product the same week. Super speedy delivery and great communication - Thanks! Really helpful and prompt advice. Thank you! Efficient and fast service and the products were great. Prompt service and delivery. Great equipment. Love my icegrippers, never felt safer on ice!! Excellent customer service - answered my questions practically by return and gave great advice. Suberb service. Needed advice on the best size ice grips to fit a pair of their snow boots and Carl took the trouble to email photos of the boots with appropriate grips fitted. Prompt dispatch and on receipt of parcel delighted to find a complimentary pair of ice grips in a smaller size. Thoroughly recommend using Icegripper. Great- out wearing these along the icy paths and we didn’t slip once. Had mine ten years but hubby is trying them for the first time! Arrived quickly. Thanks! Product arrived rusty, but was sorted out right away and my replacement has arrived safely just in time for the icy weather! Excellent customer service and product looks fantastic. Easy to use and excellent grip. Perfect store. Got a gift with the package. Thank you very much. 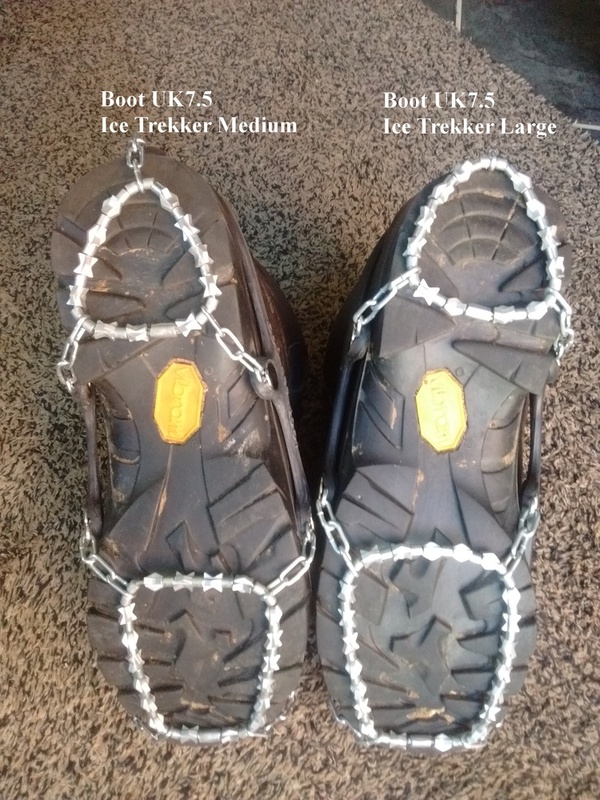 ICEGRIPPER has tested over 100 ice grips, ice cleats, shoe chains and other winter traction products, which help wearers improve their grip in icy and snowy conditions. Users of our products feel reassured when walking on ice and snow and our ice grips for shoes and boots are regularly used by the emergency services, postmen, local authorities and in the oil industry. Whether you need industrial standard ice grips, traction products for kids, specialised grips enabling you to pursue your winter sports and leisure activities, or just need to get out and about - let us advise you how to walk, work, run and play on winter ice and snow. We have assembled the broadest range of products from the world’s leading manufacturers: ICEtrekkers, Kahtoola and Yaktrax are just some of the high quality personal traction products we stock. To complement our extensive range of traction equipment we also stock a great range of winter snow boots, gloves, hats and other products enabling you to be prepared and to enjoy winter, rather than dreading it. As winter activity enthusiasts and users of our own products we genuinely enjoy advising our customers and hearing your winter stories and experiences. So give us a call, if there’s anything you want to chat about, or prefer to order by telephone. Although we have domestic and industrial customers across the UK and Europe we are still a family company offering a high level of customer service.